Opening of Lee Miller: Fotografa Surrealista exhibition this morning. I've always been fascinated by Miller. What a life she led. And this is a great exhibition, really well curated by Stefan Van Raay - that's him on the right. The man in the middle is Antony Penrose, Lee Miller's son. I somehow expected someone much older, though at 68 I guess he is, but doesn't look it. He now looks after his mother's very extensive photographic archive which is still based in the house he grew up in Chiddingly, East Sussex. The exhibition covers her early work in Paris (including co-discovering the technique of 'solarization' with Man Ray), studio work in New York, lady-of-leisure period in Egypt and, most important of all, her war-reporting work which is both shocking and strangely poetic). After that, she mainly stuck to photographing artist friends (Picasso, Miro, Moore, Dubuffet etc) while battling post-traumatic stress syndrome. 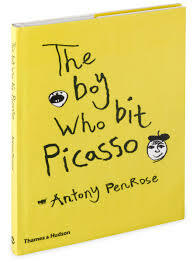 Antony gave the girls a book he wrote called The Boy Who Bit Picasso. He was that boy, back in the early 50s. He just did it on impulse. And Picasso bit him back. Nice to meet Stefan, who has a strong Chichester connection. He used to be Director of Pallant House.